Tackle Fish: Barramundi, the white snapper fish. Barramundi also known as white snipper, seabass and also white killer. Barramundi or also known as the White Snapper fish, a freshwater fish and brackish water, Sciencetific name Lates calcarifer. 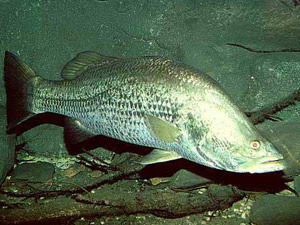 Barramundi fish is a fish predator,he inhabits the river and sea water. Its main diet is fish children (including children) andalso shrimp, small insects such as cengkerik & worms. Young barramundi eatzooplankton, this katadromous species living in the river, downriver, estuary & the valley detention for nesting. At the beginning of Monson, male fish along kehilir to meet bertina fish, which spawn inthe many (millions per individual). Fish do not keep the egg or adult child, which requirebrackish water to thrive. This species is hermaphroditik succession, most matureindividual as a male and a female after at least one season climb into the sky, with itmost of the large specimens are female. caught at Banting, Selangor Darul Ehsan.